and 6.30pm to 10.30pm (dinner). THE mere mention of Chinese New Year reunion dinner conjures images of tables overflowing with festive dishes that bear grand names and extravagant ingredients. While elaborate Chinese New Year dinners have always been central to the celebrations, conscientious diners today often prefer smaller portions that are just as celebratory. After all, the reunion dinner is more about getting together with family and friends than extravagance. At The Royale Bintang Resort & Spa Seremban, executive Chinese chef Lee Siew Hong has designed a scaled-down menu of crowd-pleasing favourites that are simple yet festive. Lee, who heads the kitchen team at the hotel’s Han Pi Yuen Chinese restaurant, said the eight-course festive set menu was tailored to suit the changing tastes of guests. “Every year, we make little changes to our Chinese New Year menu based on customer feedback. “We talk to guests after their meal to find out what their preferences are. “Based on recent feedback, most people prefer less elaborate festive meals and that is why we decided to go with an eight-course set menu this year,” he said. Lee, who has more than three decades of culinary experience, has spent years experimenting with festive menus but believes the tried-and-true is still what diners want. “We still stick to traditional elements; eight is a lucky number for the Chinese so an eight-course meal will definitely go down well. “As for flavours, we added a couple of modern twists to traditional ingredients just to keep everything light. These days, diners prefer meals that are not too heavy,” he said. 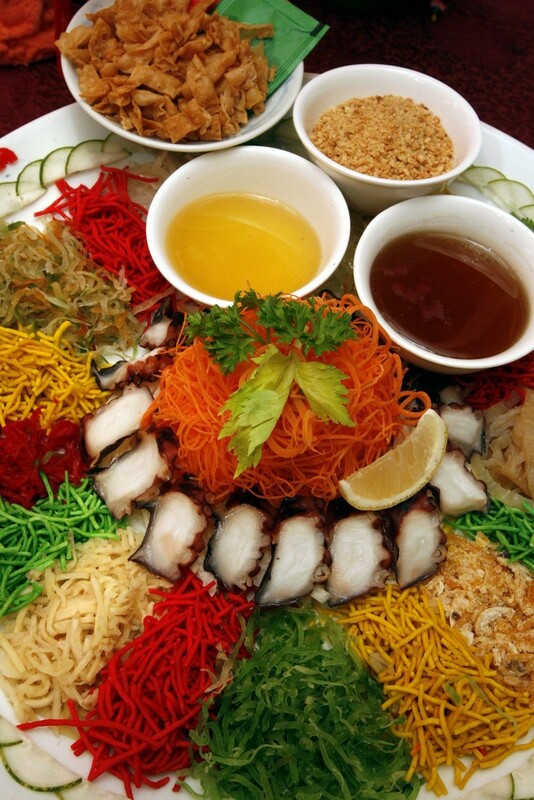 This year, Han Pi Yuen is serving four varieties of yee sang (raw fish salad) priced between RM38+ and RM128+. The yee sang, which is part of the eight-course set, can be ordered for takeaways and are available in either medium or large servings. At a recent food tasting, I sampled Prosperous Yee Sang with Tako (RM68+ / RM128+), a happy mix of crunchy bite-sized bits of Chinese crullers, matchstick-thin strips of vegetables both pickled and raw, and best of all, thinly sliced slivers of poached tako(Japanese for octopus) among its ingredients. I loved the accompanying sauce, concocted with house-made apple jam, traditional plum sauce, seasonings and freshly squeezed lemon juice. The sauce was just the right side of sweet thanks to the apple jam and lemon that added tartness and zing. This yee sang is the most expensive item on the menu, which Lee informed me was because of the tako imported from Japan. Taste-wise though, the combination of flavours and textures — the tako adding a chewy bite — went down well at the table. While pared down, the festive set menu is still a complete and hearty meal. Each of the set menus (there are three ranging from RM788+ to RM1,188+ per table of 10), also features soup for starters, and chicken, fish (synonymous with abundance) and prawn (symbolising happiness) dishes. 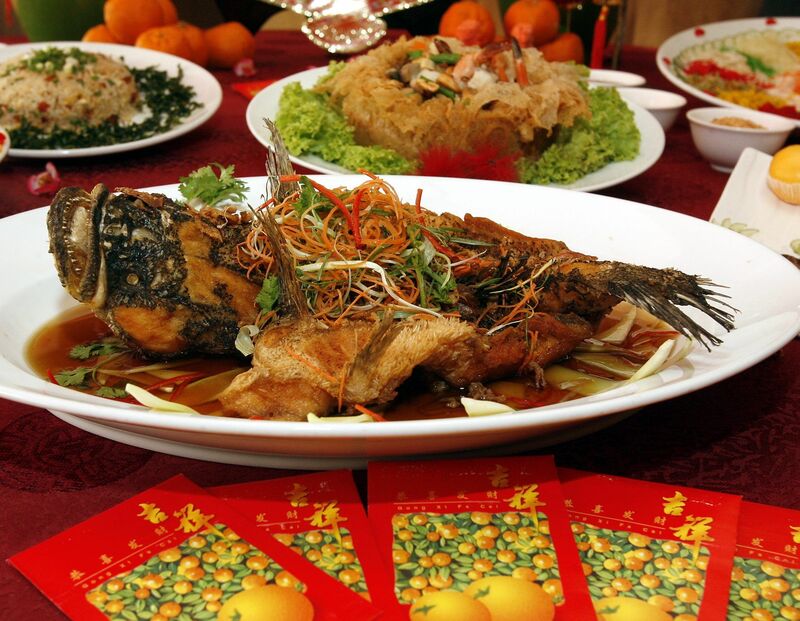 Appetising: Deep fried soon hock fish with garlic and onion sauce is among the tempting festive dishes available at The Royale Bintang Resort & Spa Seremban’s Han Pi Yuen. I had Deep-fried Soon Hock Fish with Garlic and Onion Sauce which had a delightfully crisp coating encasing the freshwater fish also known as Marble Goby. Also on the menu was Deep-Fried Boneless Chicken with Mongolian Sauce. Two deep-fried dishes for one meal may seem a little much, but thankfully neither preparation was greasy. Like the fish, the boneless slices of chicken were coated in a light, crisp batter and the peppery, sweet and sour sauce was the ideal complement. 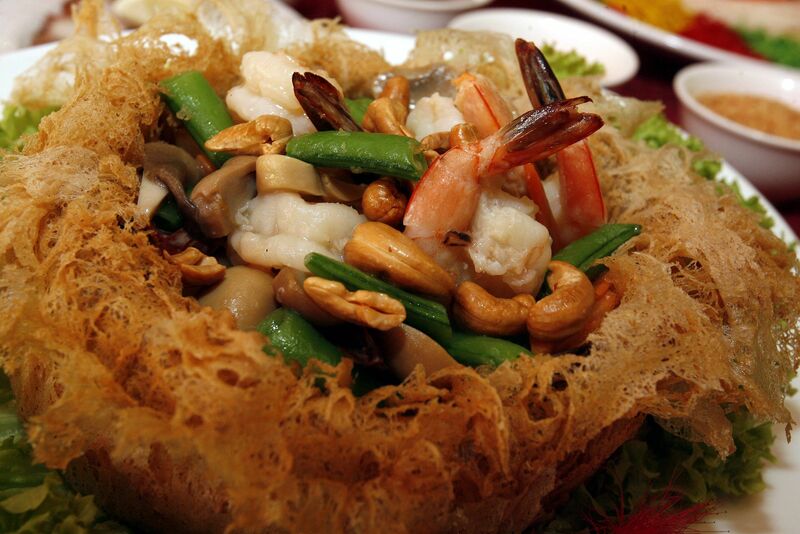 Next up was Wok-Fried Fresh Prawns in Yam Ring with Fresh Vegetables. Yam ring is one of my favourite Chinese dishes and Lee’s version with plenty of plump prawns, mushrooms and greens certainly did not disappoint. All three menus also include a rice dish, and I was served the Fried Rice with BBQ Chicken. The barbecued morsels of chicken, cooked just right, were a lovely addition to the festive rice dish. For dessert, diners have several options depending on their menu choice. Each menu includes a cold dessert: Chilled Longan with Apple and White Fungus, Chilled Apple with Sea Coconut and Red Dates or Chilled Rainbow Beancurd with Lychee Syrup. After an indulgent meal, a cold dessert is definitely refreshing and welcome. The ingredients used, like sea coconut and red dates, also serve to cool the body down after indulging in rich fare. Besides the cold treat, each menu also has an additional sweet surprise — Deep-Fried Nian Gao and Steamed Custard Salted Egg Cream Bun. I tried the latter and liked the smooth, creamy consistency of its filling. Han Pi Yuen’s Chinese New Year Set Menu is available until the end of the month. CNY Dim Sum Buffet is also available at the restaurant on Feb 19 and 20 from 8.30am to 2.30pm (pork-free), with seasonal favourites such as Dried Oyster Siew Mai and Fatt Choy Beancurd Roll among the tempting treats on offer. It is priced at RM60+ per adult and RM30+ per child (four to 12 years).